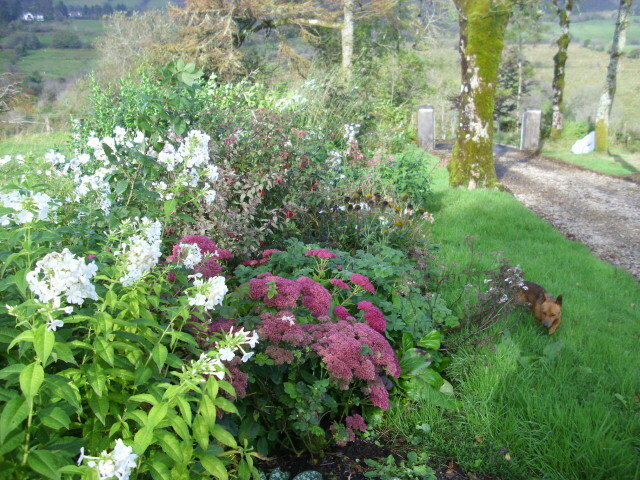 There is still lots of colour in the long border despite lots of rain and wind. Plants are a lot more resilient than we give them credit for. This bed was planted 2 years ago. Most of the plants were grown from slips and cuttings. Phlox, Sedum and Japenese Anemones give great late season interest. Many of these will be divided yet again next Spring to facilitate further garden expansion. I’m not a big fan of garden centres, plants from hothouses abroad often do not acclimatise well to our soil and climate. Much better to buy Irish grown plants when possible. As my gardening life proceeds I find myself increasingly using Permaculture techniques. Permaculture aims to create in a self-sustaining and earth-friendly way a system that provides for our human needs while working co-operatively with Nature. 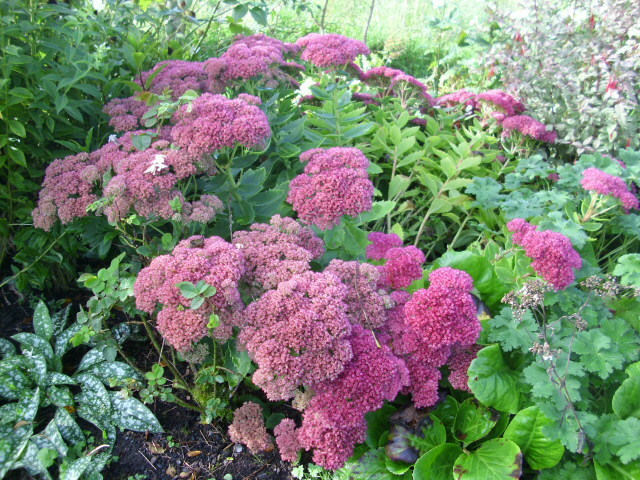 No chemicals are used and plants such as the Sedum, which is a great attractant for Butterflies, are planted extensively. Harmony between Humans and Nature is paramount. Native plants are important being hosts to many types of wildlife. Oak and Willow are good examples as they are both host to about 300 species of wildlife while also having importance for Humans. The Forest Garden by Robert Hart is a great Permaculture book as is Masanubo Fukuoka’s book One Straw Revolution. Fukuoka, one of my heroes, was writing and indeed practising Permaculture in the 1930s long before it’s fashionable resurgence in the 1970s in Australia. Fruits, trees and flowers are planted together, no monoculture. 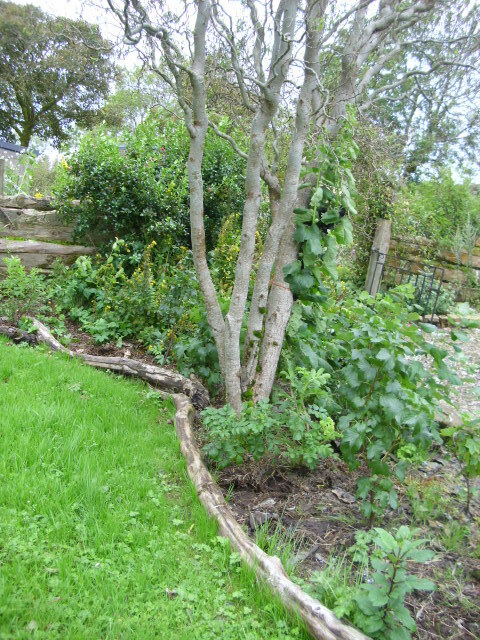 The area above was planted in Spring of this year around an established Twisted Willow. The sod was turned, plants planted then the whole lot was mulched with newspaper and straw. Raspberries, Rosa Rugosa, Blackcurrants, Mallow, Chives and Phygelius are all thriving together. Mulch will be applied again next Spring when the ground warms up. The mulch rots down over time to provide nutrition for the plants whilst keeping down weeds. In the polytunnels crops are also mixed together. Herbs, flowers and vegetables make for an interesting and colourful mix. Pests are not a problem as the mix of plants and various scents confuse them. The only problem we have found is with slugs but a good Permaculture solution to that would be to have ducks, ducks love eating slugs. The problem for us is that there are loads of Foxes in this area. We are considering making a Fox proof (fingers crossed) run over the Winter and getting Chickens and Ducks next Spring. We would as a bonus have eggs, a good source of protien produced on our own smallholding. Permaculture principles at work. Pets too have a place in the Permaculture system. They provide company for the humans and prevent Rats and Mice from building up. We have 2 terriers who are avid chasers of all intruders. Permaculture Doggies rule! Thank you for liking my post and thus giving me the opportunity to discover your blog! As a fellow permaculture enthusiast, I really enjoyed this post. Your being in Ireland is an extra bonus. My grandparents on my mother’s side were Irish and came to Australia to start a new life. Nice to ‘meet’ you. I love this way of growing and until recently hadn’t heard of it. 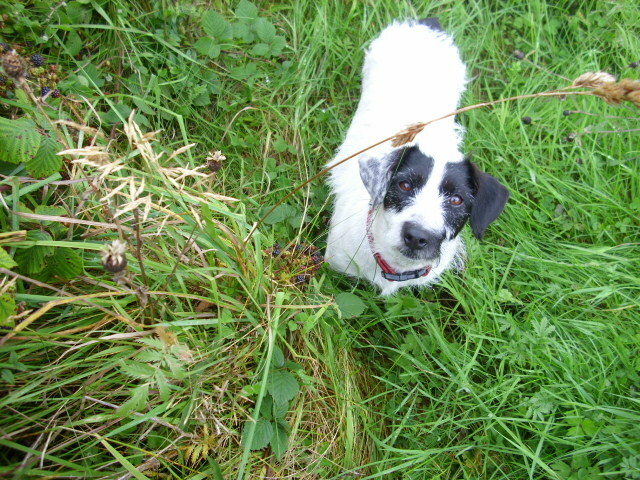 Sensible gardening, sensible gardeners have terriers too, if like me they are bothered by rats. Nice blog! Frogs are supposed to eat slugs. I’ve thought about including a small pond in my garden, but I’d probably be even more afraid of encountering frog than a slug. This is such an environmentally sound way of gardening. I am slowly moving in that direction because it makes so much sense. Great description of permaculture! Permaculture and agro- forestry are the future! At my house we LOVE native plants, mixed plantings, local markets and dogs! Further, I will keep my fingers crossed for your luck with foxed-proof-ness. I am on the look-out for permaculture information as it seems an antidote to the worst excesses of greedy and grand garden design projects. Looks so much more harmonious and love your dog. Excellent description of permaculture. I’m glad my dogs aren’t the only ones who “rule” in the garden LOL. Although our garden is a haven for all kinds of wildlife, we have been plagued at times by the destructive activities of some unwanted visitors. Thank heaven, our little Cavaliers enjoy the hunt! They have literally “saved” our garden! Wow, I learned so much from this post. And you’ve helped me to appreciate my Oak trees even more than I already did. I’ll have to check out that book! Thanks for putting a name to the kind of gardening I do. Deer chasing hound dogs rule too! Brilliant piece on Permaculture, very informative for those who perhaps havent heard of it before. Now maybe more people will enjoy healthier, happier gardens from now on! Definitely may preferred way of gardening – although I must admit – I didn’t know it was called permaculture.